Attack R2-D2! Well, not really. This BT-1 figure has removable weapons and panels to cover the holes those weapons leave. The paint job is great, and it uses a build-a-droid mold with filled in holes for the lower body leg holes. I like it. Read on! At the Hasbro fan breakfast yesterday, we got a look at the Imperial Patrol Trooper coming to The Black Series at some point in the next few months. I't from Solo: A Star Wars Story which a straw poll around here seems to indicate a lot of fans didn't even bother to go see - a shame, as it looks more like a Star Wars movie when it comes to characters and costumes. Captain Phasma (First Order Disguise, The Last Jedi Line Look) was meant for a main line release, but ended up almost not coming out - instead, you can find it as an Entertainment Earth exclusive. She has a staff, a backpack, a cape, a blaster, and Finn too. I love how both arms are pre-posed to hold either weapon, plus they painted her arms silver rather than molding them in a not-matching swirly color. It's nice. Read on! So check out Rose (Crait Defense) from the four-pack from The Last Jedi. It's cool! She has her necklace, and what's left of her First Order uniform. And a blaster. She's one of the cooler figures in the set, so assuming you didn't already buy one and are just looking to have your good sense of taste reenforced read on! It's Dr. Gonzo! Er, the Wolfman! Ah, that mumbly guy! 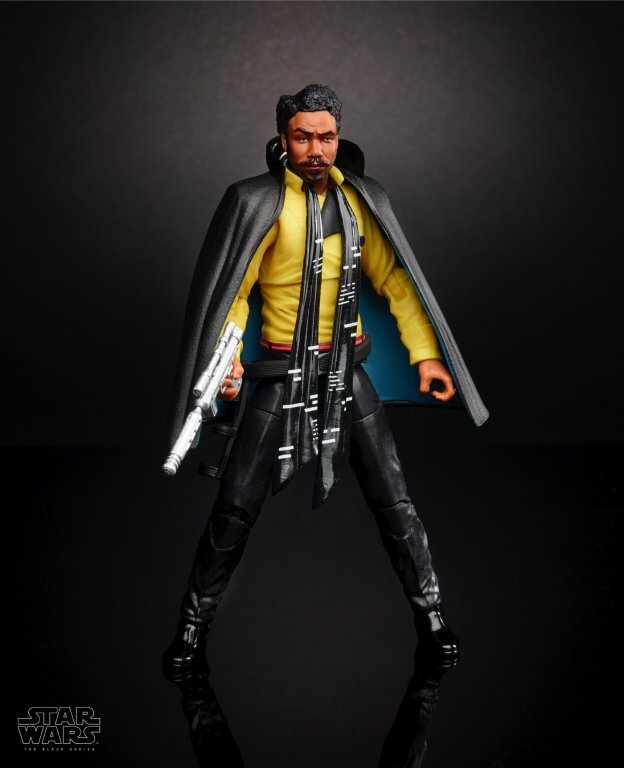 DJ (Canto Bight, The Last Jedi, The Black Series 6-Inch) has a pretty great likeness and a fairly Star Wars-y costume. Also, two blasters. You may have seen him around, but if you haven't should you buy him? Read on! The title says it all: Jon Favreau to Executive Produce and Write Live-Action Star Wars Series. There is no date and no real details, other than this will be for Disney's new streaming platform at some point in the future. For those keeping track, this means there's a movie series coming from the Game of Thrones showrunners, another one from Rian Johnson, this TV show, Episode IX, and probably another spin-off and a cartoon in there somewhere. The Elite Praetorian Guard was sold as a Force Link exclusive starter set at Toys R Us... and either sold or was disappeared. I remember seeing these come out and being surprised as they started to dry up in November and December, leading to not all that many at some locations last I checked. This guard has 2 unique accessories and an exclusive-to-this-release helmet. I assume you've bought yours. Read on!